My first named African Violet was from Richter's Greenhouse. My husband stopped in on the way home from work, looking for a Mother's Day gift. It would have been in the late 1970's. Later he drove me over there to look. If you have never stepped into a greenhouse full of wall-to-wall blooming violets, you may not fully grasp the awe-inspiring feeling it brings. And if you have ever shopped for violets on eBay, you certainly are aware of the "gotta' have it" feeling when admiring all those blooms. Of course hindsight is 100%. I was a young mother, I knew very little about African Violets and nothing at all about the African Violet Society of America (AVSA). So while I was deciding between white blooms with pink frills and blue doubles, my husband was busy talking to the hybridizer, Forrest Richter. Mr. Richter took my husband into a private greenhouse and showed him all the propagation tables and some of his award-winning show plants. I could kick myself! Now jump forward about 30 years. I have shelves of violets, belong to the AVSA, have shown twice and won some ribbons. 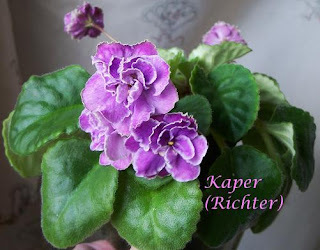 My husband's favorite violet is Kaper. One day out of the blue he says to me, "Why don't you collect Richter's violets to preserve them". Permission to shop!!! So, it became a Quest, and I have found several. I'm sure there are more Richter's violets out there. Some people might not even know they have one because they only have a plant stake with the name in pencil. 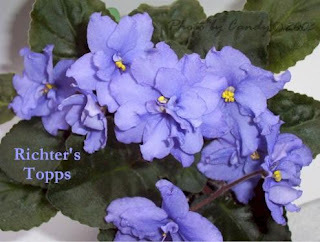 On my website (Candy's Violets) I have a list of Richter's violets and their descriptions as a reference. Here is my current list of Richter violets. Thank you everyone who has shared plants and leaves!! I hope there are more. Sounds like you're doing great on your Richter's quest! Congrats!